I've been focused on finishing my HERMS (Heat Exchange Recirculating Mash System) since I got back from the National Homebrewer's Convention. I was finally able to afford the remaining parts and tools I needed to put it all together. 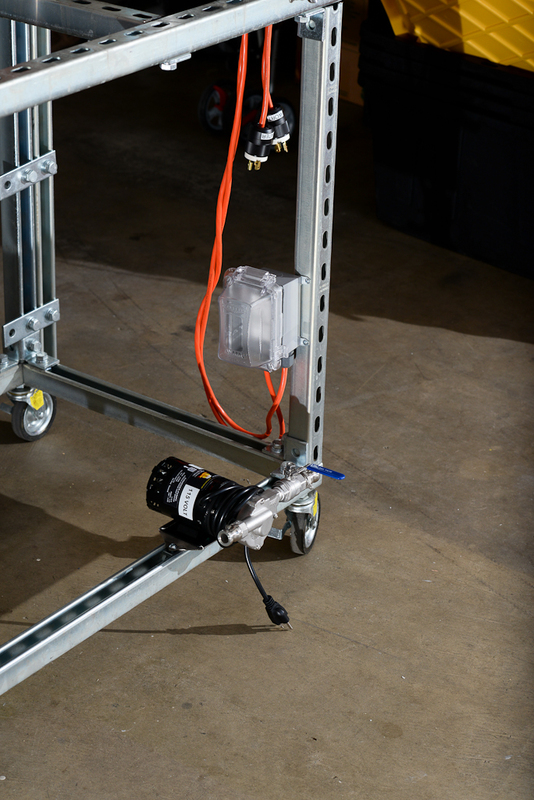 Using both gas and electric is an unusual choice as most brewers either do one or the other, but not both. I decided to go electric on the HLT as there are less moving pieces than a gas fired temperature control setup (no gas solenoid, no ignitor, etc.). Why keep gas for the boil kettle then? For one, I already had the burner, hoses, and natural gas connection in my garage. The other reason is that I wanted to be able to do back-to-back batches (that is, boil one batch while heating the strike water for another batch) and to do that with electric, I would have had to build a 50 Amp control panel and I would likely have had to have the service panel on my house upgraded at a considerable expense. The panel is powered by my dryer's 30 amp 3 wire outlet. From the dryer outlet, I run a 10/3 cable to a 50 Amp Spa panel with a built-in GFCI. I drilled a 2 1/8" hole in the side of the spa panel and mounted a 4 wire dryer outlet. I followed the instructions in this thread to wire the spa panel. From the spa panel I run 25 feet of 10/4 cable to the input of my panel. 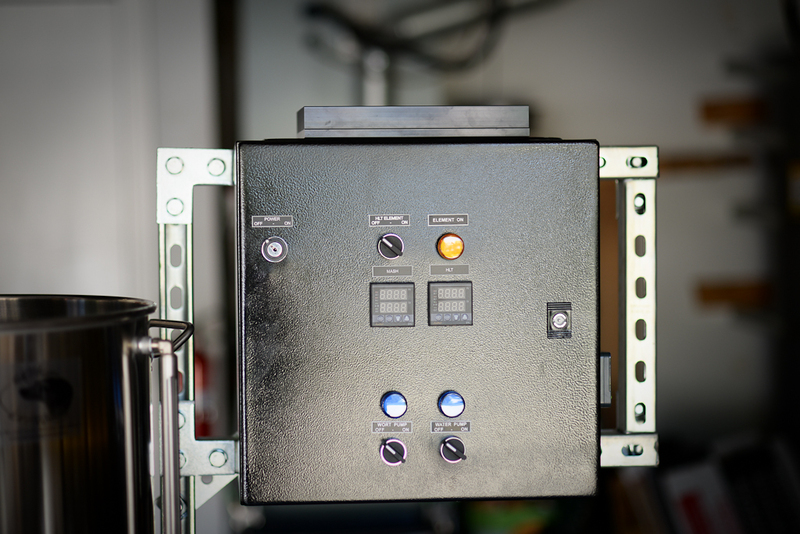 I followed a lot of the instructions from The Electric Brewery, but I edited down my panel quite a bit (no alarms, two pids, no startup interlock, no volt or ammeter, no timer). This simplified the design and cut a lot of cost. 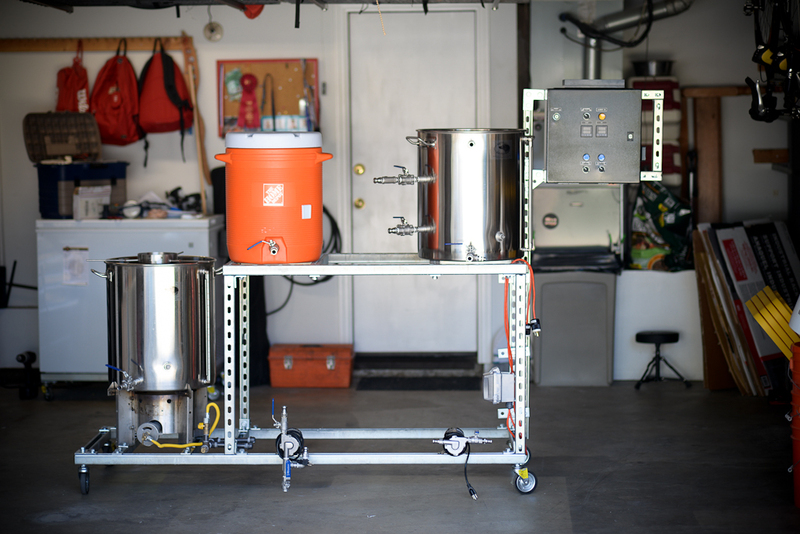 After I finally got everything wired up and working it was time to brew. I've been meaning to brew a Pliny the Younger inspired beer. I used the recipe posted here as a guideline, but decided to use WLP090, San Diego Super Yeast, instead of WLP001, California Ale Yeast, because I've been getting bored with WLP001 and I had a fresh vial of WLP090 in the fridge. I was targeting an OG of 1.091, but ended up at 1.098 (around 72% efficiency for me). It's nice to finally be able to brew a huge beer and not have my brewhouse efficiency drop into the high 50's. If the yeast fully attenuates, I should end up with a 12 or 13% triple IPA. You may notice that I'm still using a 10 gallon cooler mash tun...I plan to sell my old equipment (cooler mash tun and HLT, 8 gallon kettle, and sparge arm) and use the proceeds to get another 20 gallon kettle with false bottom, thus allowing me to brew 10 gallon batches instead of just 5 gallon batches.